Psychological Experts in Divorce Actions, Seventh Edition is the definitive guide to understanding the role of psychological evaluations in divorce and custody actions. Focused on providing the best approach to protecting your client’s interests, this work explains all the leading testing instruments, what conclusions may be drawn and how to challenge or support those conclusions. In addition to offering effective examination and cross-examination strategies, it assists you in handling the gamut of psychological factors that affect clients in divorce and custody cases. 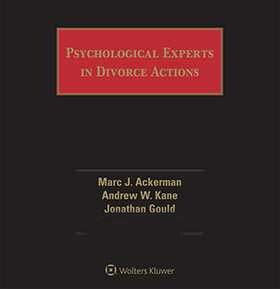 Authors Marc J. Ackerman, Ph.D., Andrew W. Kane, Ph.D., and Jonathan W. Gould, Ph.D., A.B.P.P., are licensed psychologists who have been involved in thousands of custody cases. Drawing on their extensive experience—testing parties to a divorce and treating psychological patients in the clinic—and as psychological experts in the courtroom, they identify the most important psychological evaluation research used in divorce and custody decision-making and distill the information into clear terms lawyers can readily apply. Chapter 3: What Constitutes a Psychological Evaluation in Child Custody Disputes?